While the first few months aren't traditionally known for huge box office debuts, 2016 has proven to be an anomaly, with a number of blockbusters arriving in the first half of this year. Deadpool shattered box office records left and right with a $132.4 million opening, en route to becoming the biggest R-rated movie of all time with $763.2 million worldwide. That movie's three-weekend streak atop the box office was ended by another blockbuster, Disney's Zootopia, which has become a huge hit with fans and critics alike, earning a whopping $991.8 million worldwide. While we don't know if it will cross $1 billion yet, with its release on Blu-ray and DVD next week, the animated movie has now become the second biggest original movie in box office history, behind James Cameron's Avatar. This report from Forbes sheds some light on Zootopia's success, which is even more impressive in today's current movie climate that is oversaturated with reboots, sequels and adaptations. Of course, it's roughly $1.7 billion below Avatar's all-time worldwide mark of $2.7 billion, a box office record that even Star Wars: The Force Awakens ($2.06 billion) couldn't beat. Still, its results do signal that there is an audience for completely original movies, which have become less and less prevalent these days as studios try to build franchises out of properties with built-in audiences. Zootopia has taken in $336.1 million domestically, the fourth highest total this year behind Disney's The Jungle Book ($340.7 million), 20th Century Fox's Deadpool ($362.7 million) and Marvel's Captain America: Civil War ($377.1 million). Zootopia's $991.8 million worldwide take is second biggest this year, behind Captain America: Civil War ($1.1 billion), but it's possible that The Jungle Book ($879.8 million) could catch up with it, since it was released a month earlier than Zootopia, but we'll have to wait and see. 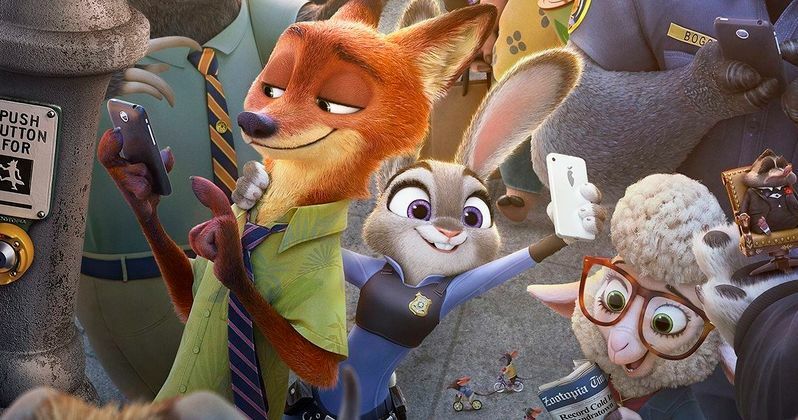 Zootopia also ranks as the fourth-biggest animated movie of all time, behind Toy Story 3 ($1.063 billion), Minions ($1.159 billion), and Frozen ($1.276 billion), although it doesn't seem that it will be able to catch any of those movies before its run comes to an end. It also ranks as Disney's 11th biggest movie globally, and the sixth biggest "non-sequel/prequel" of all time, behind Alice in Wonderland ($1.025 billion), Jurassic Park ($1.029 billion), Frozen ($1.27 billion), Titanic ($2.186 billion), and Avatar ($2.787 billion). The movie is also one of the best-reviewed movies of 2016, with an astonishing 98% score on Rotten Tomatoes, with just four negative reviews out of 209. The modern mammal metropolis of Zootopia is a city like no other. Comprised of habitat neighborhoods like ritzy Sahara Square and frigid Tundratown, it's a melting pot where animals from every environment live together-a place where no matter what you are, from the biggest elephant to the smallest shrew, you can be anything. But when optimistic Officer Judy Hopps arrives, she discovers that being the first bunny on a police force of big, tough animals isn't so easy. Determined to prove herself, she jumps at the opportunity to crack a case, even if it means partnering with a fast-talking, scam-artist fox, Nick Wilde (Jason Bateman), to solve the mystery. Zootopia will be available on Blu-ray 3D, Blu-ray, DVD and Digital HD formats on June 7.